Did you know that gyoza – those moreish dumplings you get from Japanese restaurants – are surprisingly simple to make? Victoria shares her easy recipe for gluten-free gyoza with the choice of two delicious fillings. 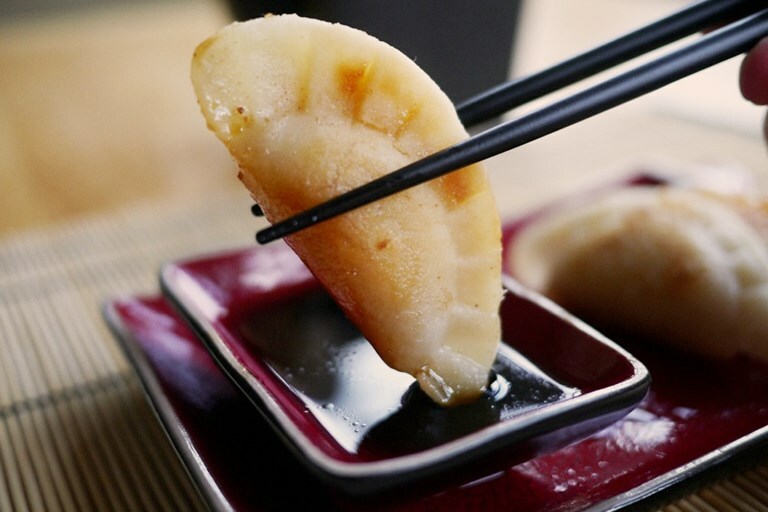 A steaming plate of these moreish dumplings, dunked in a simple soy and mirin sauce, is hard to beat. When ordering gyoza in a restaurant, as with most tiny parcels of food, it’s quite easy to get swept up with the idea that you’ve barely eaten anything. They’re only little after all. You continue popping one more, after one more, tiny morsel into your mouth until, suddenly, out of the blue, you’re groaning under the weight of pork and cabbage. That’s the thing about gyoza: they’re just so irresistible, once you start, you can’t stop eating them. They seem like the kind of thing that would be nigh on impossible to achieve at home, but I’m going to let you in on a little secret… They’re incredibly easy and cheap as chips to make! Feed your friends a plate of these and they will think you’re a culinary wizard. In fact, I can’t think of another impressive dinner party dish that makes so much food for so very little money. All in all, it’s a win-win. If your body is lucky enough not to be thrown off balance by a bit of wheat in your dumplings, you can buy gyoza wrappers at most Asian supermarkets, or online. If, on the other hand, your constitution is a little more sensitive, don’t fret, you needn’t feel left out. I have created a wheat-free gyoza wrapper that doesn’t tear open on filling and doesn’t split or turn to mush on cooking. My gluten-free boyfriend was so delighted when I first made them that he did a little jig while rummaging in the cutlery drawer for the chopsticks. Gyoza are most traditionally stuffed with pork and cabbage, but as I served these as a precursor to ginger pork belly, I decided to make half with chicken and sesame and the other half with prawn and chilli. I also treated myself to gyoza press, a fun little gadget for under a fiver that made the business of construction a lot quicker and simpler.